When will Africa abandon the Ezulwini consensus? Efforts to reform the 15-member United Nations (UN) Security Council have become an annual ritual in New York. During the general debate at the General Assembly last year, the issue was again raised countless times. Members called for reform by 2015, since this year marks the 70th anniversary of the UN. Thus far, every effort at reform has fallen foul of power politics. It would seem that all countries are in favour of reform until it gets to the detail. Then, after much lobbying, numerous meetings and increasingly convoluted proposals, the status quo is eventually retained. Bruised diplomats retreat to their respective national corners to contemplate a next round, and so the charade continues. An amendment to the UN Charter to effect reform requires a two-thirds majority out of a total UN membership of 193. This would include, eventually, national legislation to this effect in each of the five permanent members namely Russia, the United States of America (USA), China, the United Kingdom (UK) and France. So, how can the process be restarted when key countries – the five permanent members with veto rights in particular – have no interest in acceding to such change? In April this year, after several months of consultations, the current chairperson of the intergovernmental process on UN Security Council reform, Jamaican Ambassador E Courtenay Rattray, embarked on a clean slate approach. Instead of trying to unblock the impasse, he circulated a one-page ‘framework’ outline consisting of various headings, which member states were requested to populate with their suggestions on reform. By 13 May, Rattray had received inputs from countries and groups that probably represent close to two-thirds of the member states of the UN. These included input from 30 individual countries plus the Africa group, the L69 (representing countries from Africa, Latin America and the Caribbean, Asia and the Pacific), the G4 (Germany, India, Japan and Brazil) and Guyana (on behalf of 12 small island states). These recommendations have now been summarised in a 24-page consolidated framework document. Impressive as the response is, opposition is strong. China rejected Rattray’s approach, deferring to an earlier negotiation text and was supported by Italy (on behalf of the Uniting for Consensus group) as did the 22-member Arab group. Although not rejecting the clean slate approach, Russia and the USA, in their separate responses, insisted that no reform should tamper with the prerogatives of the current permanent members, including the right of veto. France indicated it would not oppose the expansion of the veto to additional permanent members, while the UK opposed such expansion. There are clear signs of an emerging consensus on the size of a reformed UN Security Council and various other proposals. Yet key positions on reform remain as entrenched today as they have been for several decades and the prospects for progress are faint. With its 54 members, Africa presents an important swing region in these negotiations. Ten years ago, the African Union (AU) adopted the Ezulwini Common African Position on UN Reform, calling for 11 additional members on the Security Council, thus proposing to expand its size from its current 15 to 26. Africa wants two permanent seats and five non-permanent seats that would rotate between African countries (one for each of the five regions in Africa, north, east, west, central and south). Africa’s position is that as long as the anachronism of the veto exists, any new permanent members should gain all existing privileges, including veto powers. For its part the AU would ‘choose’ the two new permanent seats representing Africa, although exactly how that will occur in the context of a multipolar continent is unclear. Although a number of cracks regularly appear, intense pressure from the G4 in particular has not been able to prize Ezulwini asunder. The African position is therefore only likely to change once real reform and a balanced formula are on the table. Until then, Africa and like-minded groupings, such as the L69, may not have a majority, but can clearly block any others. In the meantime, the lack of legitimacy of the Council is a cancer that eats away at every institution within the broader UN system. Power is shifting, but not in the Security Council, where the victors of a war fought 70 years ago determine every important decision. Reform of the UN Security Council and nuclear disarmament are possibly the two hardest global security issues to crack. They are also linked. Earlier this week, the ISS reported on the failure at the review conference on the Treaty on the Non-Proliferation of Nuclear Weapons to reach consensus on next steps. The five nuclear weapon states – which are also the permanent members on the UN Security Council, namely China, France, Russia, the United Kingdom and the USA – have again reneged on their treaty commitment. It is no surprise that others seek nuclear weapons when big brother, who needs it least, conspires to keep them. Eventually, the entire UN edifice may haemorrhage legitimacy to the extent that it loses its relevance if efforts for reasonable reform continue to be frustrated. 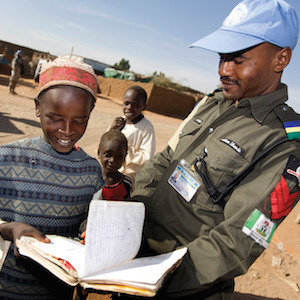 The ISS seminar 'Now is the time for UN Security Council reform' will be held on the margins on the African Union Summit on 12 June 2015 in Johannesburg.